As a huge fan of Crown and Glory, when I found out they ran a subscription box, called The Glitterati, I felt like I had died and gone to heaven! This is definitely my favourite subscription box that comes to my door but due to my lack of funds and a want to save, I am going to make this my last box for a while! My inner Accessory Queen is sat in the corner sulking right now and I’m in a little shock that I am actually going to do this! Because of this I was kind of hoping this box would be a bit of a letdown to justify my decision. But no, it’s perfect, it’s Halloween themed and just beautiful! This month’s treats included a black rose crown which is just stunning, a gorgeous animal print hair scarf. Also included was a hair band which has devil horns on it and two bronze feather clips. 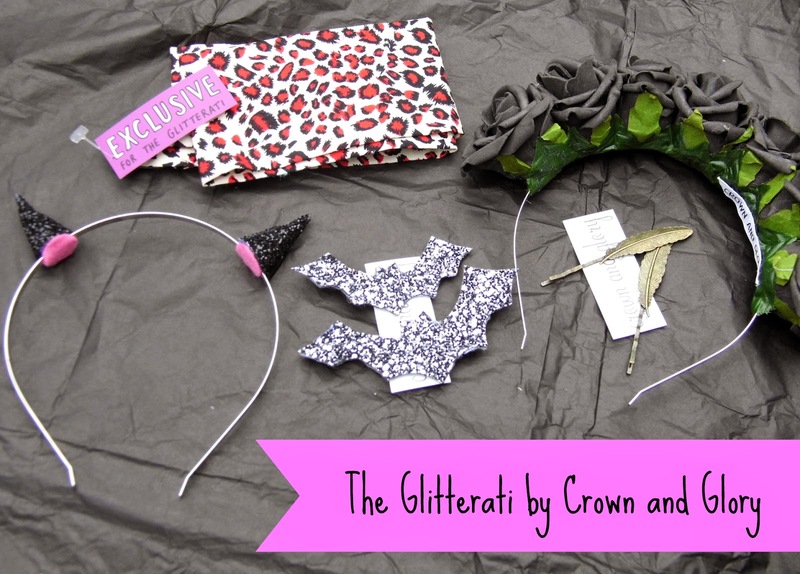 My personal favourite has to be the black glitter bat hair clips. They shall be worn on Friday for Halloween! Eeeek! All these items equate to over £50 worth of goodies, so for £20 including postage it’s a bit a bargain! Sigh, I am in hair accessory heaven! Whats on my face // Party Edition!